Last week, in this space, I wrote about Dave Dombrowski’s Achilles’ heel in the wake of the Tigers letting go of their long-tenured general manager. 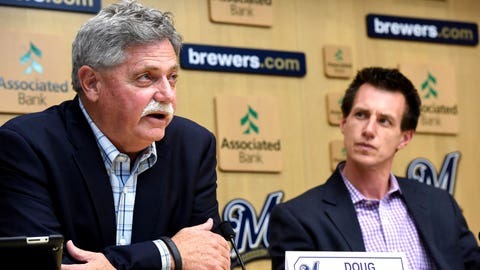 On Tuesday, another long-term general manager was relieved of his duties, as the Brewers have moved Doug Melvin "into an advisory role", opening up their GM position for the first time since 2002. Like Dombrowski’s start in Detroit, Melvin’s first few years in Milwaukee were pretty rough. The team lost 94 games in both 2003 and 2004, then hung around .500 for the next three years. So it was five years of laying the groundwork for a competitive team. But in 2008, things started to come together around a strong young core that included 24-year-old sluggers Prince Fielder and Ryan Braun and 25-year-old middle infielders J.J. Hardy and Rickie Weeks. To supplement the team’s homegrown core of All-Star hitters, Melvin made a big midseason trade for CC Sabathia, whose dominant performance helped carry the team to its first postseason berth since 1982. While Sabathia was just a half-season rental — and predictably signed for big money in New York that winter — the Brewers retained the young core that looked like it should form the foundation of a perennial contender. However, from the start of the 2009 season until Melvin’s resignation, the team went just 540-545 and made the postseason in only one out of those seven years. While Dombrowski is leaving Detroit on the back of a long run of success that might just now be coming to an end, Mevlin’s track record is more of a long string of unfulfilled potential. So why weren’t the Brewers able to turn one of the best young groups of homegrown hitters into a consistent winner? Unlike with Dombrowski, Melvin didn’t have one glaring flaw that came back to haunt him on an annual basis. Instead, the Brewers’ lack of success can be chalked up to three significant organizational failures over the past seven years. The Brewers’ initial surge in the middle of Melvin’s tenure was primarily based on hitting on their top draft picks for the better part of a decade. From 1999 to 2008, the Brewers’ first-round picks included not only the aforementioned Fielder, Braun and Weeks, but also Ben Sheets, Brett Lawrie, Jake Odorizzi and Matt LaPorta, who was used as part of the package to acquire Sabathia in 2008. Including supplemental selections for losing free agents, the Brewers have made nine first-round picks from 2009-2012, and exactly one of them — Taylor Jungmann — has made the big leagues. Certainly, it’s harder to be as successful picking in the middle and end of the first round as opposed to the top 10 — where the Brewers landed the bulk of their young core — but their failures to convert first-round picks into useful big leaguers meant that the farm system simply wasn’t able to replenish the talent base as the young core became older and more expensive. Since the team added Jonathan Lucroy as its starting catcher in 2010, the best position player to come out of the team’s minor-league system has been Khris Davis, who profiles as essentially a league-average corner outfielder. And things aren’t a lot better on the pitching side of things, even with Wily Peralta and Jimmy Nelson currently holding down rotation spots. Even as the two recent success stories of the team’s crop of pitching prospects, neither has developed into an above-average pitcher. As a mid-market team, it’s difficult to compete when the best outcome you’re getting from your minor-league system is solid average role players. In the winter of 2010, the team decided it needed to acquire another ace in order to contend, so it made a deal with the Royals to bring Greinke to Milwaukee. In exchange for two years of Greinke’s services, the Brewers surrendered shortstop Alcides Escobar, center fielder Lorenzo Cain, and pitchers Jeremy Jeffress and Odorizzi. Greinke pitched well in Milwaukee, even though his ERA was inflated by the team’s poor defense behind him, and the team won 96 games in 2011, reaching the playoffs for the second (and last) time during Melvin’s tenure. So, there was a certainly a short-term gain, and the team offset some of the prospect cost when it shipped Greinke to the Angels at the 2012 trade deadline, aiming to replace the shortstop and pitchers it gave up to get him in the first place. The problem is that, while both Escobar and Cain have turned into All-Stars and Odorizzi was used as part of the package that brought James Shields and Wade Davis to Kansas City, the Brewers’ deal to send Greinke to the Angels returned Jean Segura, Johnny Hellweg and Ariel Pena. Segura had a couple of good months to start the 2013 season but has been among the worst players in baseball since, while the two pitchers haven’t helped the Brewers in any way. This isn’t to say that the Brewers shouldn’t have made the Greinke deals; you know that you’re probably taking a long-term hit when you make trades like that, with the real possibility that the deal could hurt for a long time if the guys you give up develop. But generally, when you trade away a package of prospects, you expect only one or maybe two to come back to haunt you, and even the one successful one often will be more of a solid piece than a star. Since the start of the 2011 season, though, Cain and Escobar have combined for +25 WAR, while Odorizzi has added another +4.5 WAR for the Rays since getting to the big leagues. Segura, as a Brewer, has been worth +3.2 WAR. Greinke helped the team to a playoff run, but the current version of the Brewers would look a heck of a lot better with Escobar at short, Cain in the outfield and Odorizzi in the rotation. Over the past four years, as team has tried to reconstruct rosters to get back to the postseason following its strong 2011 run, the Brewers have given at least 200 plate appearances to 22 different position players. Here are a few of the luminaries who have somehow managed to find their way into semi-regular playing time for the team since the start of the 2012 season. The "R" in WAR stands for replacement, which is the estimated level of performance a team should be able to expect from the kind of player you could claim on waivers or sign as a free agent for the league minimum. Somehow, the 2012-15 Brewers have managed to hand out nearly 4,000 plate appearances to a group of players who have combined to be worse than that replacement-level baseline. It’s not so much the -3.0 WAR that is the killer here, but the sheer quantity of plate appearances that went to some of the game’s worst players. These eight players combined for 18 percent of the team’s total plate appearances over the past four years; that’s the equivalent of two everyday spots in the lineup. And the team just threw away those at-bats, giving regular playing time to guys like Yuniesky Betancourt and Alex Gonzalez when it was beyond clear that they didn’t have anything left to offer a big league team. And making matters worse, many of those at-bats came at first base, theoretically the easiest position on the field to find a guy who can avoid embarrassing himself at the plate. During his time in Milwaukee, Betancourt got 177 plate appearances while playing first base; he posted a .220 on-base percentage as a first baseman. Gonzalez managed to get under even that mark, putting up a .219 OBP (and .226 SLG) in 64 plate appearances as a first baseman. And when those guys weren’t playing first base, the Brewers found at-bats for guys like Taylor Green, Jason Rogers and Sean Halton. While it’s easy to point at the guys who are in the lineup every day as reasons for the team’s struggles, the Brewers’ inability to find decent role players also helped bring down the franchise. If the team could have simply managed to fill out its roster with guys who could produce a little bit of value in part-time roles, Milwaukee might have had another playoff run. But it’s hard to collect enough star power to overcome throwing away a couple of lineup spots every night. And that’s what the Brewers’ lack of depth has forced them to do for the past four years. The Brewers’ recent struggles have led the team to finally admit that something of a rebuild is necessary. And with the Cardinals, Pirates and Cubs looking like they’re going to provide some very tough competition in the NL Central for the next few years, now is probably a good time for the Brewers to start over. While Melvin did bring some good baseball to Milwaukee for a short stretch, the mistakes of the past five years suggest it was probably time for someone else to be in charge of rebuilding the Brewers’ roster.